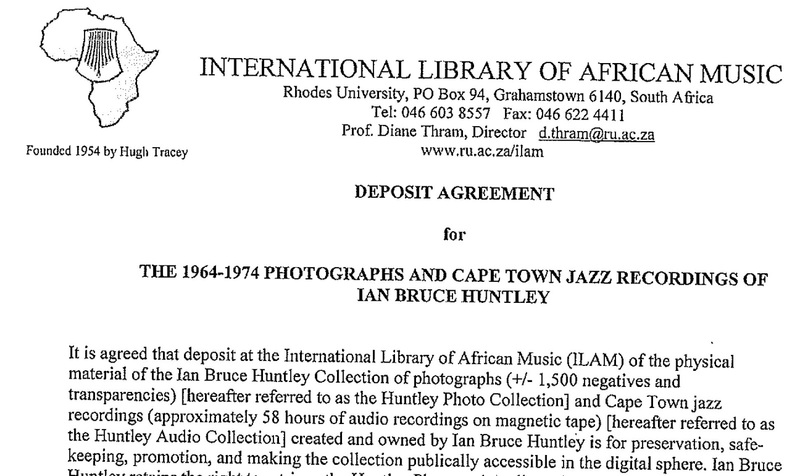 I am excited to announce an important milestone in preserving and making Ian Bruce Huntley's extraordinary archive of jazz audio and images accessible. 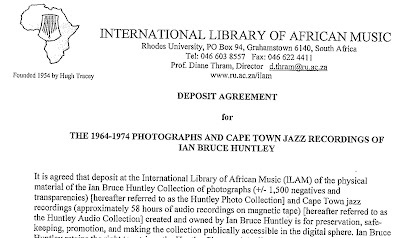 In celebrating this deposit agreement Electric Jive shares some recordings from the archive that have been re-mastered by Miloš Latislav as a voluntary contribution to demonstrate how such recordings can be enhanced. Thanks again Miloš. Ian has preserved around 1500 images of jazz performance from all over South Africa, and also in Lesotho when Dizzy Gillespie visited. 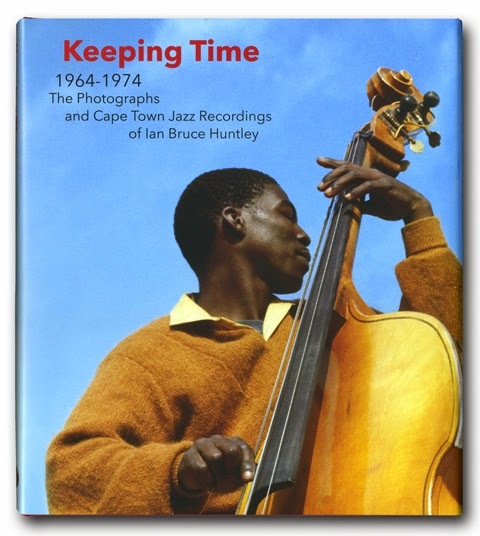 Ian selected 120 of these images to be presented in the book "Keeping Time" - click on the cover image to the right of this post if you have not yet visited the Huntley Archive on Electric Jive website. In addition to freely accessing 58 hours of music, you can also download a free copy of the book there. Ian has now agreed that his original reel-to-reel tapes will become deposited and preserved at the International Library of African Music. The Director of ILAM, Prof Diane Thram, has also agreed to upload the full audio files to the ILAM website and make them freely available for anyone wishing to download these. It is agreed that "ILAM will make no sale or commercial use of the audio archive or its contents nor will it allow anyone else to make sale or commercial use of the audio archive". In addition to committing staff time to processing the archive and making it accessible, ILAM has committed a sizable sum of money for "professional re-touching of a further 350 images selected by Ian for the purposes of re-sale via editorial e-commerce". Africa Media Online have already scanned these images and are in the process getting them ready to go online. Ian will benefit from some of the income generated from any sales of these images. The enhanced audio shared here today is three tracks recorded on the occasion of the very last time that Johnny Dyani and Dudu Pukwana performed in South Africa, days before going into exile with Chris McGregor and the Blue Notes via the Antibes Jazz Festival in July 1964. Captured at “The Room At The Top” in Cape Town by Ian Bruce Huntley, this live gig represents a poignant last union and “point of fracture” from which six very talented artists struck out to seek their respective musical fortunes. Also shared are four tracks recorded by the Jazz Disciples in the same year. Before Dudu Pukwana joins in for the last two tracks, Ronnie Beer demonstrates his class with the band rendering his own upbeat composition, ‘Immediately’. Bra Tete does his own bit of vocal scatting following his fingers in joyful moments of letting go. The towering Dudu Pukwana summonses attention in the opening of ‘Green Dolphin Street’ before the conversation meanders comfortably along, providing spaces for exploratory solos. It is an historical sadness that a beautiful Pukwana solo is abruptly interrupted for what was the end of one side of Ian’s reel-to-reel tape. In May 1964 "The Jazz Disciples" went into Cape Town's SABC studios to record for Radio Bantu, without Ronnie Beer. In "Black Composers of Southern Africa", Yvonne Huskisson documents the SABC recording as being made by Tete Mbambisa (piano), Sammy Maritz (bass), Max 'Diamond' Dayimani (drums), Dennis Mpale (trumpet) and "Bunny" (Barney) Rachabane (sax). Ronnie Beer was also considered a member of the Jazz Disciples. We can only speculate as to why he was not included in that particular Radio Bantu recording session. Perhaps it was to do with the SABC's own racial policies at the time? 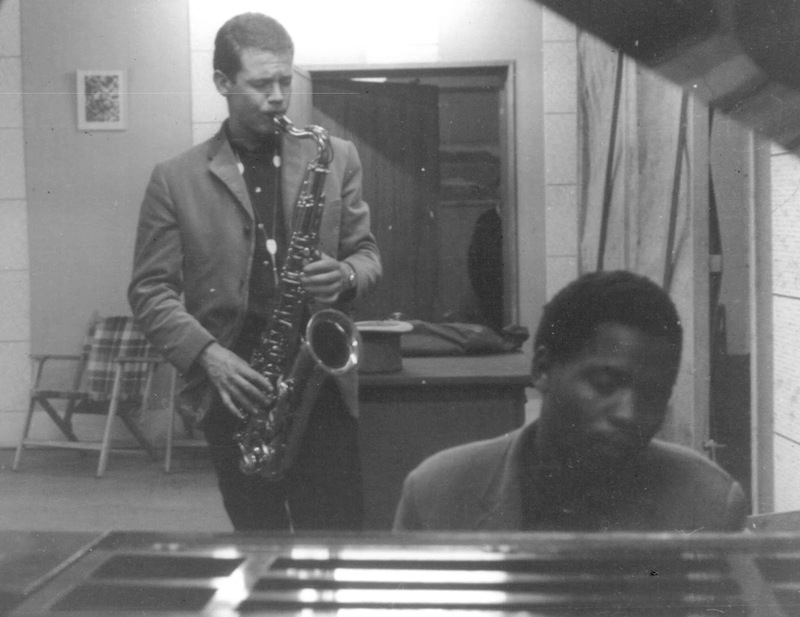 Shortly thereafter, Ronnie Beer rented the Thibault Square recording studio in Cape Town for an hour and he and the Jazz Disciples laid down four tight tracks - one of which we need some help in identifying. Ian Huntley happened to tag along and plugged his reel-to-reel into the sound desk, and here, nearly fifty years later the recording comes to light. We do not know what Ronnie Beer did with the recording he made of that session. Maybe he wanted to press an LP - four songs, thirty minutes - but it just never worked out? Ronnie Beer (saxophone); Barney Rachabane (saxophone - age 18); Dennis Mpale (trumpet); Tete Mbambisa (piano); Max 'Diamond' Dayimani (drums); Sammy Maritz (bass). Great piece of news for preserving IBH fantastic pictures! And thank you for the sound improvement. I am delighted to hear again this gems. By the way, what about for tape 42 ? This is indeed fantastic news. Congratulations. Downloading the "remasters". I always felt the IBH tapes were far too bass heavy and needed tweaking. Can hardly wait to hear the improvements on the two presented here, two of my favourites from the archives. Have finally gotten around to loading these up to compare and I'm confused. The originally posted "Last Night At The Room At The Top" is a different recording, with four songs, with a different (yet overlapping) track list. Was the same source tape used? If so, what happened to the fourth track and which song titles are correct? In addition to my last I must add the remastering work is fantastic! Just done a little A-B test and wow, so much more clarity in these new versions. I still believe there is too much sub-bass present, but perhaps rolling that off would weaken the overall punch too much? Great work! Fantastic music ! (If required, I use the equalizer (foobar 2000) to gently adjust frequencies, but most of the time I'm too lazy to do so). Many thanks for offering us these great moments !! Hi Chris, we are lucky to have you. Thanks Chris. My confusion was because I have the original files from the first upload where "On Green Dolphin Street" is mis-labeled as "I'll Remember April". I see it has now been corrected in the original post. It all sounds amazing to me. Can hardly wait to hear more remasters like this. I still say these IBH Archives deserve a CD release somewhere. Precious jewels they are!